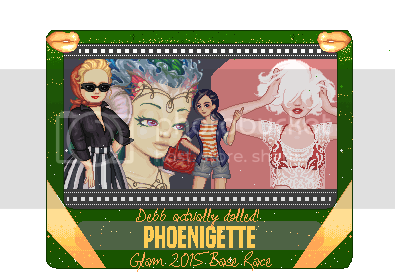 my dolls so far this year ;u; - GLAM! All of these are so pretty! I love the pose on the skull one. They look beautiful! I love the technique you've been using on the hair, and I wish I was good enough to try something like that. I think I looks especially nice on the skeleton doll (who turned out so cute, by the way. I love how the bones look! ), and in the final doll with the animation, because of all the colors on them. shixam what are you talking about!? you are awesome! You have no idea how much that means coming from you! I love the geometric way of shading you've adopted. I've done a doll with similar shading and it was quite the challenge. I'd love to try to do move. ; u ; You palettes are also lovely. I especially love the two on your private base. Very cool. i love how you've been doing your hair! it's really unique and i love how it looks all shiny and jewel-like. I've commented on most of the others individually, but I have to say I absolutely love that skulleid doll. The contrasting colors are great and on this doll the triangular hair really works, like on the portrait. It's almost as if it were designed for this one. The sharp contrast sparingly placed throughout the hair really helps guide the eye down through the piece. A+ job!